VISIT THE 2ND GRADE PHOTO GALLERY! I Know I Can Go To College Reading Week. Local college students participate in a lesson plan covering what it is like being in college and why it is so important to have high educational aspirations. During the visit, the children's motivational reader, I Know I Can, is read aloud and the college student volunteers give a copy of the book to each child at the session's end. Celebrity Reader Week. Dozens of working professionals from the community, representing a diverse array of occupations, participate in a lesson plan covering careers and high educational aspirations. Prior to the visit, the students prepare interview questions about the readers’ occupations. During the visit, the book, Career Day, is read aloud and the Celebrity Reader brings visuals from their own profession to show the students, reinforcing how important education has been to his or her career choice. Each student then receives a career reader to take home from the "Whose is This?" series. Reading Rocks at the Library. Each building’s second grade classrooms visit the Licking County Library where a community volunteer reads the book, The Little Engine That Could. During the story hour, college student volunteers interact with the children about key lessons in the book and reinforce the notion that hard work and determination are also required to go to college. In addition, the children tour the library and interview a special community guest. PEAK also coordinates a semester-long library card registration drive. PEAK Week. Reinforcing the two themes of college and careers, teachers guide students through targeted activities like doing a virtual tour of their college campus, choosing occupation books for read aloud time, playing career tic-tac-toe and writing away for a college view book as a class. During the week’s activities, the students are also hard at work creating their very own “Imagine My Future” booklet. Every page represents a step in their pathway to success: high school graduation, attending college, earning a degree and choosing a career. College Comes Into The Classroom. Thanks to over 30 generous Denison volunteers, eight second grade classrooms learn about the history of Bluegrass music while enjoying a short concert by a Bluegrass ensemble under the direction of music department chair, Andy Carlson. The sixteen other second grade classrooms are treated to a lesson about the five senses by students from Suzanne Baker's education class. At the end of each of the special activities, the second graders quiz the Denison volunteers about college. 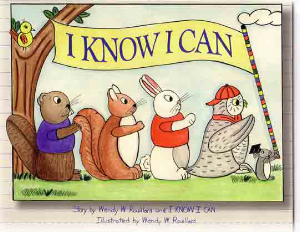 The book I Know I Can features four animals who aspire to go to college. This fall, 40 members of the Denison Football team volunteered to serve as college role models by participating in the "I Know I Can Go To College" Reading Week. © 2016. All Rights Reserved. A Call to College.